Lillian (1867–1940). American nurse; founder of the Henry Street Settlement in the Lower East Side of New York City, one of the first nonsectarian visiting nurse services in the world. 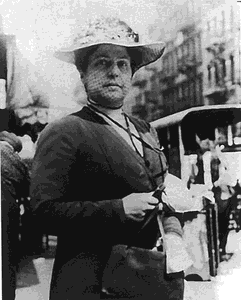 Lillian Wald. Courtesy Visiting Nurse Service of New York. an American public health nurse, settlement leader, and social reformer. She founded the Henry Street Settlement in New York to bring nursing care into the homes of the poor. This led to the development of the Visiting Nurse Service of New York. She was also instrumental in establishing the school nursing system, the federal government's Children's Bureau, and the Nursing Service Division of the Metropolitan Life Insurance Company. She was the first nurse to be elected into the Hall of Fame for Great Americans. Wald, should prompt a shift in thinking about antibiotic strategy for AOM. Furthermore, the values of the Wald tests, namely those obtained with the dynamic GMM estimates, indicate that PRIVDEBT is relevant to explaining the evolution of economic growth, not only in the previous year (in t-1) but also jointly in t-1 and t-2. A depressao maior foi a comorbidade mais comum (n = 6), sendo que no estudo de Wald (2004), um participante foi diagnosticado com transtorno de panico com agorafobia (remissao parcial) e o mesmo tambem era dependente de alcool (remissao completa); e Walshe et al. Wald finds resonances of the lyrics in folklore, a traditional spiritual and a parodic spiritual, an antebellum minstrel song, and a British nursery rhyme, demonstrating that "the dozens was always part of a larger world of signifying, arguing, teasing, joking, and versifying" (61). When Lillian Wald published her memoir Windows on Henry Street in the 1930s, Henry Street had already gone through its first phase of evolution, from a grassroots social experiment to a fully formed, quasi-governmental institution entrenched in Manhattan's political and philanthropic establishment. Wald noted that the decision to treat can involve a trade-off, so these guidelines offer the clinicians more latitude in making the cost-benefit analysis with the parent, taking into account the illness severity, the child's quality of life, and the parents" values and concerns. Wald told a reporter he is "cautiously optimistic" the settlement will be approved. It may therefore seem churlish to wonder about the ultimate scholarly achievement of this study of the period that Wald labels "late antifascism. In this exhibition, the Alfa Art Gallery celebrates the wide-ranging spirit of public service in the arts by featuring another non-profit gallery - the Sylvia Wald and Po Kim Art Gallery, located at 417 Lafayette Street, in Manhattan. Michael Wald the answer is an astounding "yes" if your patients answer yes to three or more of the questions below. Antak complained to security and told them to hold Wald until police arrived.